The White House has taken an extraordinary action to block a major corporate deal that could give China more influence in global technology. In an order Monday, President Donald Trump blocked Broadcom's $117 billion bid for Qualcomm due to national security concerns. He wrote that there is "credible evidence" that Broadcom and its affiliates "might take action that threatens to impair the national security of the United States." He said the two companies must "immediately and permanently abandon the proposed takeover." Broadcom said in a statement late Monday that it is reviewing the order and that it "strongly disagrees that its proposed acquisition of Qualcomm raises any national security concerns." Broadcom's hostile takeover of Qualcomm (QCOM) — the latter company rejected the bid — would have combined two computer chip makers. It had been under investigation by the Committee on Foreign Investment in the United States, or CFIUS. The inter-agency panel is chaired by the Treasury Department and vets deals that could give a foreign investor control of a US business. CFIUS said one big concern is that a takeover would cause the United States to fall behind on the development of 5G technology and allow China to take the lead. Qualcomm is known for inventing 2G and 3G wireless network technology, and it has been investing heavily in 5G research. Broadcom (AVGO)primarily makes chips for wired broadband communications, such as modems, Wi-Fi, switches and routers. While its operating headquarters are in California, the company reincorporated in Singapore a few years ago. 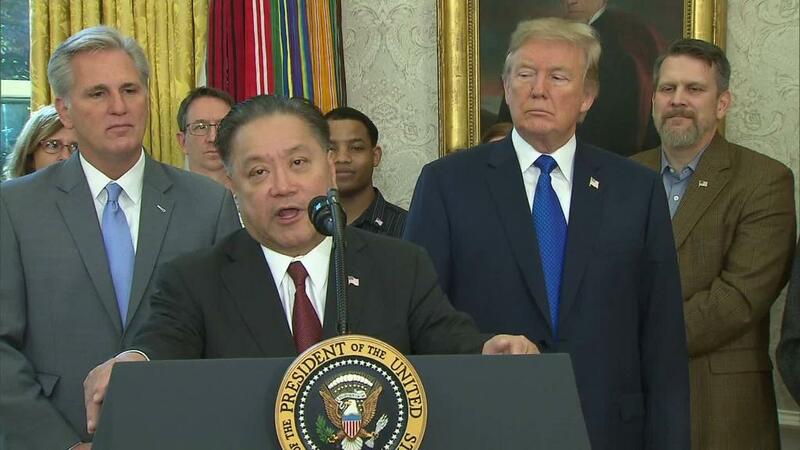 Trump hosted Broadcom CEO Hock Tan at the White House last November when the company said that it would move its legal headquarters back to the United States. Trump touted the decision as a win for American workers. The move had been scheduled for May, but the company said Monday that it now expects to complete it a month early. Last week, the government laid out a series of concerns about the potential merger in a letter to the two companies. CFIUS disclosed that it was looking at "the risks associated with Broadcom's relationships with third party foreign entities," as well as the "national security effects of Broadcom's business intentions with respect to Qualcomm," according to the memo, which was written by a Treasury Department official. Broadcom then claimed that if it acquired Qualcomm, it would commit to making the United States "the global leader in 5G." The company added that it would create a new $1.5 billion fund to train US engineers. In another letter Sunday, the Treasury Department official, writing on behalf of CFIUS, said that the investigation had "so far confirmed" the body's national security concerns. The official added that without new information, CFIUS would consider referring the matter to the president. Treasury Secretary Steven Mnuchin said in a statement Monday that the decision was based on "national security sensitivities" and was "not intended to make any other statement about Broadcom or its employees, including its thousands of hard working and highly skilled U.S. employees." Qualcomm said late Monday that it received Trump's order, and that under the terms of the president's action, "all of Broadcom's director nominees are also disqualified from standing for election as directors of Qualcomm." Trump's ability to block the deal stems from a decades-old law that gives the president the authority to stop foreign firms from taking over US companies if there is a national security concern. And Monday was not the first time the power has been used. In recent years, presidents have given particular scrutiny to semiconductor companies. Last September, Trump stopped the takeover of the American chip maker Lattice Semiconductors by Canyon Bridge Capital Partners, a private equity firm with ties to China. And in 2016, President Barack Obama barred a Chinese-owned business from buying part of Aixtron. The German semiconductor company has US operations in California.